Are you an active/daily player looking for a guild to grow with and learn from? We are looking for players of ALL levels who are playing daily and want to work as part of an active team. We have a strong leadership with experienced players from main guild dropping down to help out academy as and when needed so we can farm HPIT and HAAT consistently. We are very chatty on Line App across both guilds so their is a ton of guidance and resources available to help you build your roster and gain the best rewards. We have members across Europe and in North America and looking to conquer the world! * Very organized leadership with excellent participation/records in both Territory Battles and Territory Wars. * Active daily players who want to work together. * A willingness to work on squads and characters to benefit both yourself and the guild. THE SENATE is an alliance of guilds that supports players at all levels of play. We are a community of resourceful, experienced players who strive to grow and develop ourselves and our peers to achieve great things! Whether you are a new player looking to get guidance on how to develop a solid roster of Heroes, or an experienced player hoping to reach a higher tier of play with like minded individuals, we support guilds at all stages of the game. As a community oriented alliance, The Senate strives to be a welcome environment where players can feel free to dive into deep roster strategy, or just kick back and joke around with fellow Senate members. The Senate is a place where you can feel like part of a thriving group, and a place to call home. Looking for 1 for 116 million guild. Looking for people who are or are close to HSTR ready. 1.5 million or up. Lower could be accepted if close to HSTR ready. 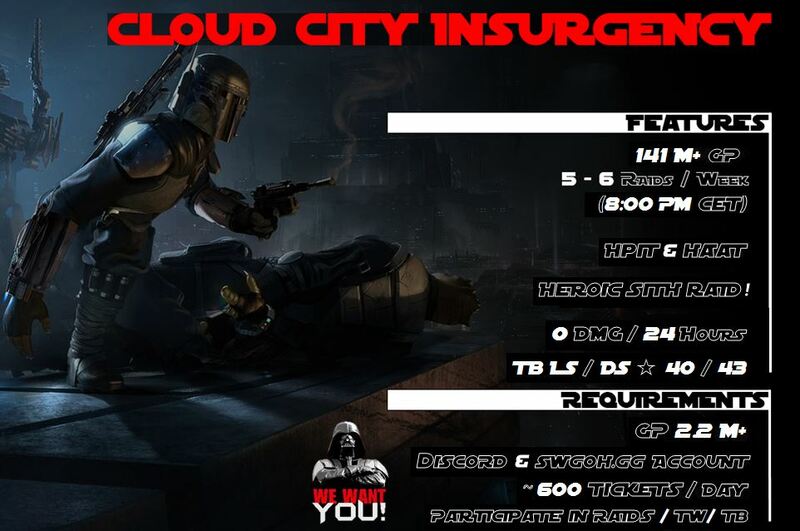 We plan on running heroic sith starting in Feb.
We run hPit and hAAT 2-3 time per week and T6 Sith twice a week at the moment. Never missed a TW for lack of participation. 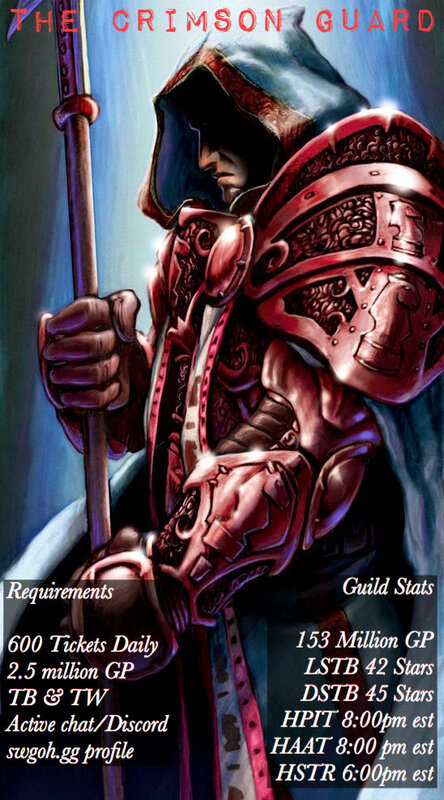 We are a USA based guild but also have multiple international players in our Guild. Heroic raids running at 8 PM EST. Tier 6 Sith raid on auto launch. 1. Active contributor to all Guild events. 2. Active daily to help generate raid tickets. Contact me for any questions on discord at Rellim Cire#6096 or in game (438-658-111). 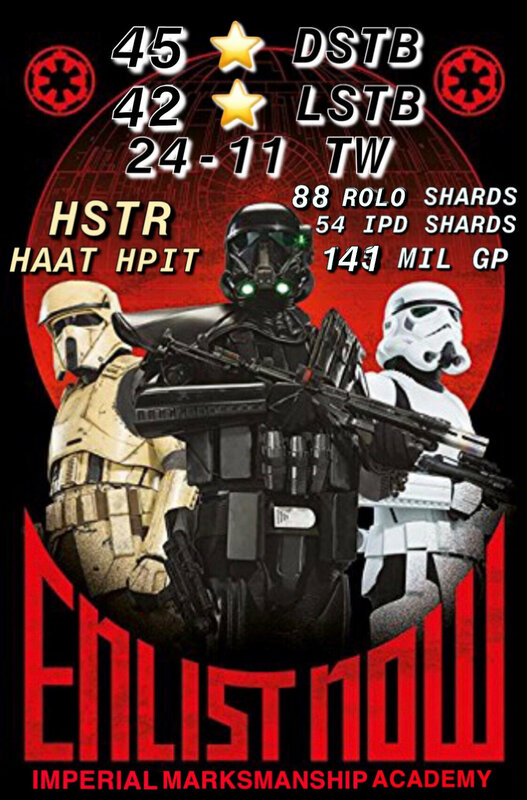 - We're looking for players that can deal 5m+ damage in HSTR and are willing to participate actively in TB and TW. - Every team can clear HSTR in less than 3 hours. - We require 600 daily, HSTR, TB and TW participation. Looking for 3-5 members to fill spots of long time players leaving game due to burnout. We’re a very successful guild that our preforms a lot of guilds with similar GP. Great Organization, timely TB/TW commands and great member base with lots of experience. 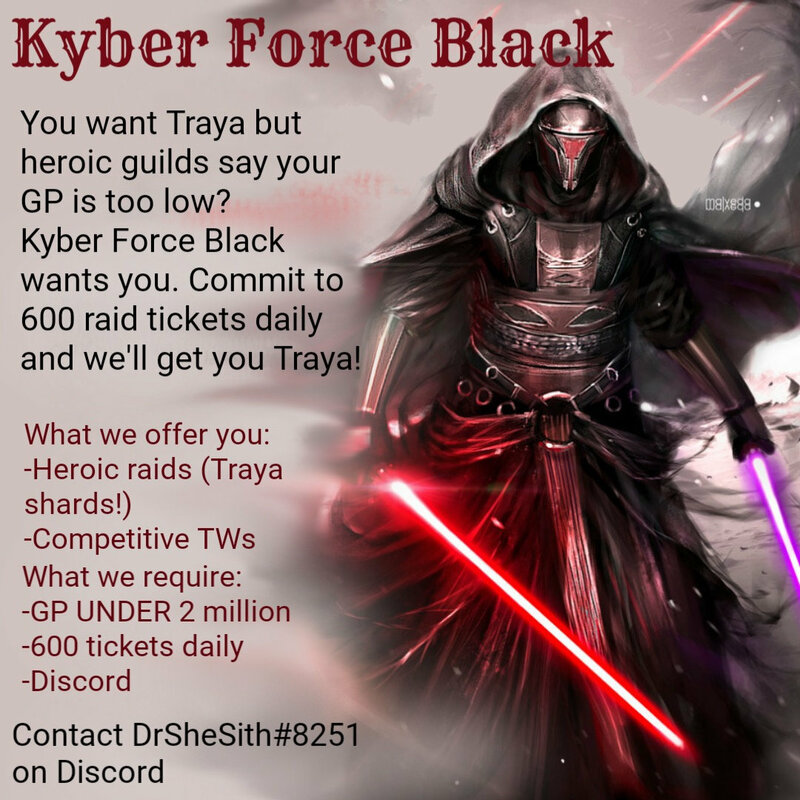 - Run an ALT Guild for extra Raids in between TBs and TWs. - Developed/Developing TB and TW squads. Looking for that last player to get our roster up to 50 !!!! The "Premier League" is looking to round out our guild with 3-4 new recruits - we very rarely have openings, so here is your chance to be involved with a great group of players who love the game! Come and join a great group of players to learn from, share your thoughts and ideas with and grow together! Search for Premier League and join. 92 mil gp guild. Members in US and Europe. Friendly guild who help each other out. Heroic Pit/ Tank. 24 hr join then FFA. T6 Sith building towards Heroic. 50+ TW wins defense required at least. TB participation required. Good to have necessary characters. Discord and in game chat used. Absence tracking channel in discord for vacations. We have recently had to make cuts on inactive players. We have room for up to 15 new members (lvl 85). We would prefer 2m+GP account or close if you have a good younger account. Make 600 or close to it a day and help in TB and TW. One or two good HSTR teams to get Traya shards on farm. Willing to join discord and link up on swgoh.gg if not already. We are an active UK based guild looking for daily players. Currently we have 49 players and a GP of 95 Million. We have a mix of players who recently started up to experienced players, always helping each other improve and have fun. - Have JTR, CLS or Revan, or willing to farm them. We are looking for active players, level 85 and good GP (~2M). We do not have a 600 raid tickets per day rule, but we expect you to contribute as much as you can. For communication, raid rules and helping each other we use Discord which is mandatory. Time Zone : CET (Middle Europe Time) Important for Raids!! 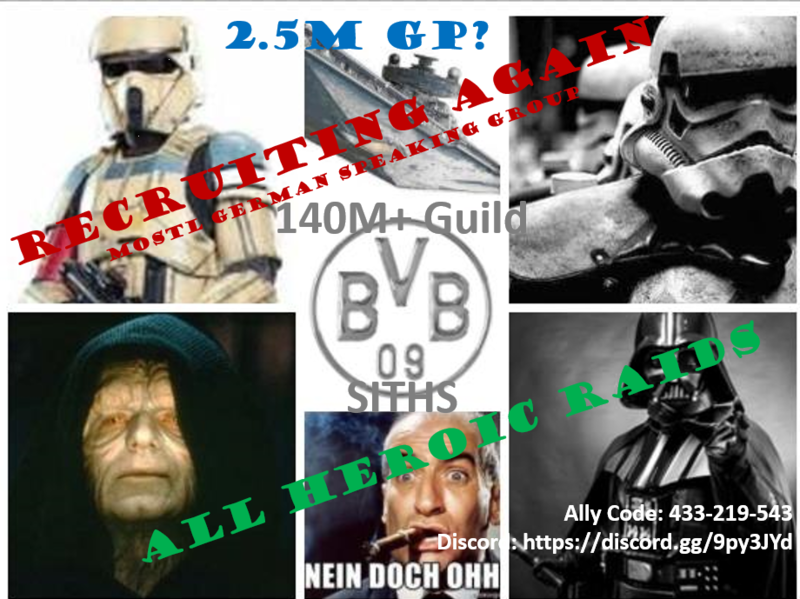 We are a mostly german speaking guild, very kind and helpful and we are always recruiting. All heroic raids!!! We have 140M+ GP and 41* last LS TB. 39* on last DS TB. We are looking for active players, level 85 and good GP (~2.5M). Provide 400-600 raid tickets per day rand contribute as much as you can. Discord is mandatory. If you are interested or have any questions feel free to message me on Discord or leave a message here. My ID on Discord is hugoiceman#0250. The Millenium Alliance - 95mill GP 43/50 members looking to fill missing slots with active members! We are an active guild with rapid growth and very knowledgeable officers and members who are always willing to give advice and answer questions. Heroic Pit and Heroic Tank run as soon as raid tickets are available Both have a 24 hour join period to allow each member to enter - after 24 hour period is over any member can post damage. Heroic Sith is on the farm - active members farming relevant characters for Heroic Sith will speed this up! We have won the majority of Territory Wars and set defenses strategically so we ask that attention is paid to commands during the setup phase - our current strategy has been very successful! 48 hour inactivity period before being kicked. If going to be inactive for a period of time we ask for prior warning and you will not be removed - everyone has a life outside of the game! 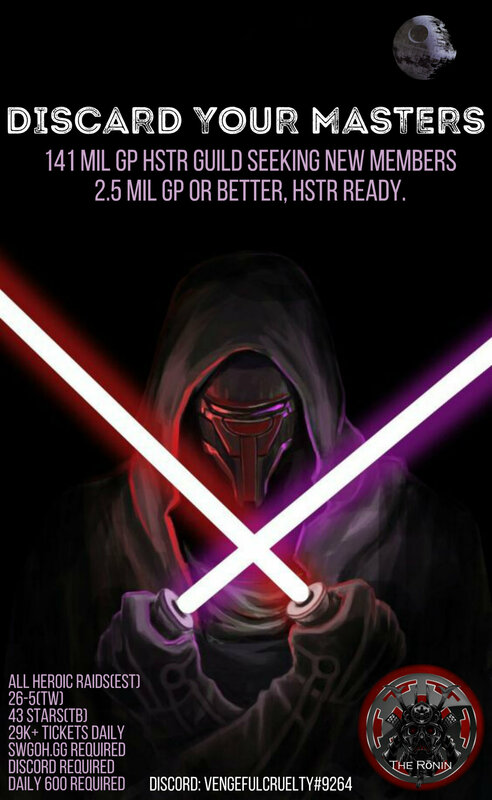 We are looking for members that are 2mill gp+ and preferably focusing on characters to help complete HSTR (JTR, Nightsister, Revan, Bounty Hunters etc). We are UK based guild (with UK and US based officers) and are looking to fill the final spots. We are looking for minimum lvl 85, 1.5 million+ GP members with a good understanding of mods. We run Heroic Rancor 2-3 times a week and HAAT twice a week. We are a semi-casual guild looking for active players. Sith Triumverate tier 5 Begins when we have tickets. Minimum Requirements: 800k GP, 3000 tickets weekly. Active in raids, Territory Battles, and Territory Wars. Currently, 48 in the family with a 97 million++ strong Guild Power. Hello! Come join our friendly active guild. Any level is welcome. Many of us have been playing for 2+ years so have plenty of experience and can offer plenty of advice. Chat app - Add GradientBiscuit on LINE mobile app and we will add you to the group chat. If you have any questions, message me on here or message GradientBiscuit on the LINE mobile app. We are PTA SWH an European guild and we're around 106 M GP. We belong to a community (not alliance) of more than 400 players. Here you will always have feedback about the game and other things in life in general. Our objective is to start HSITH in one week and we want to recruit two COMMUNITY ACTIVE players. Crimson Guard is recruiting Crimson Knights! CG is a full heroic casually competitive guild. We are currently looking for 2 new members. Send a private message if you are interested!! !